Head coach Art Briles announced the news on Friday. 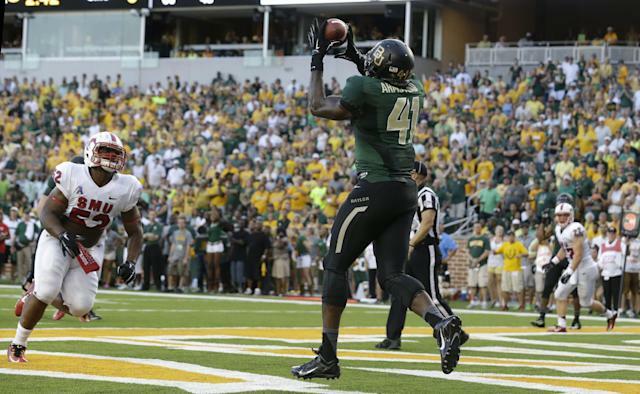 Armstead, a 6-foot-6, 265-pound junior, came into the season as Baylor’s starting tight end. After starting the season opener against SMU, Armstead was held out of last Saturday’s win over Lamar for what Briles said was a violation of team rules. Armstead played in all 13 games in 2014 as a sophomore, including six starts, and totaled five catches for 62 yards and a touchdown. He also played in 13 games as a reserve tight end and on special teams in 2013. With Armstead out of the picture, Baylor has 400-pound LaQuan McGowan next on the depth chart at tight end. Seniors Gus Penning and Lee Bristow, sophomore Jordan Feuerbacher and freshman Sam Tecklenburg are also on the roster at tight end for the Bears. Baylor (2-0) has a bye this weekend. Next on the schedule is a home game against Rice on Sept. 26 before Big 12 play begins.